future of the Port of Alaska. View recent Port of Alaska-related news coverage. Port of Alaska is Alaska’s premier inbound cargo port that handles more than 3.5 million tons of fuel and freight annually. About half of all Alaska inbound marine cargo crosses the port’s docks . 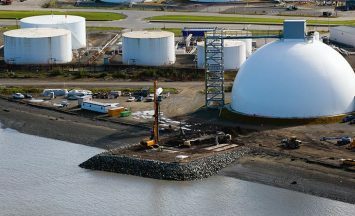 . . that leverage hundreds of millions of dollars of public and private infrastructure, including more than 125 acres of cargo handling yard, 3.4 million barrels of fuel storage, 60,000 tons of cement storage . . . and marine, road, rail, air and pipeline connections to all of Alaska. 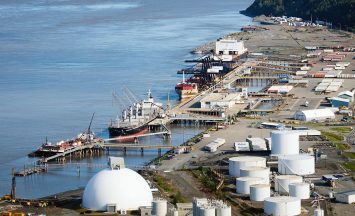 The Port is located in tsunami-proof Upper Cook Inlet, adjacent to Alaska’s population center and primary business and transportation hubs. It is U.S. Department of Commerce Foreign Trade Zone No. 160 that provides tariff benefits that improve federal, state and local business competitiveness. 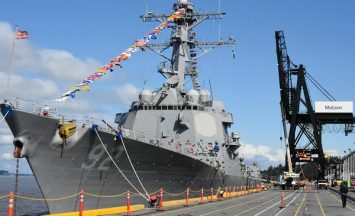 It is also one of 17 (including Guam) Department of Defense-designated “U.S. commercial strategic seaports” nationwide. Port of Alaska serves deep-water vessels that operate year round to transport cargo faster, cheaper and more reliably than any other means. It is a critical piece of economic and national defense infrastructure that helps keep our nation strong . . . and Alaska produce fresh.